Ooh la la! Can we talk about the love I have for this shirtdress? It's super comfy and you wouldn't think it, but pretty soft. June has been a weird month when it comes to weather. From one day to the next here in Montreal is can go from hot to cool. This shirtdress is the perfect thing to wear when it's not quite warm enough to go sleeveless and not cold enough to wear a pullover sweater. It's also practical lately because my son is constantly on the go. Seems like he keeps getting faster and faster and I can't look away for a second, or else he's gone again! This shirtdress still makes me feel like I'm still functional and comfy and what's great, it can aslo be worn with heels for a day at the office! Click here to see who I've linked up with. What a great dress! Love this comfy and stylish look! love the chucks! I have mine on heavy rotation right now too. pairs perfectly with just about anything! Such a cute, comfy outfit! I love everything about this look! The dress is my fav!! This is such a cute look! I love your Converse, I just got a pair & have been wearing them with everything! I love the background for these pictures! That shirtdress is perfect and I love the bright red bag! Converse with a dress is my favorite Summertime look! So chic! 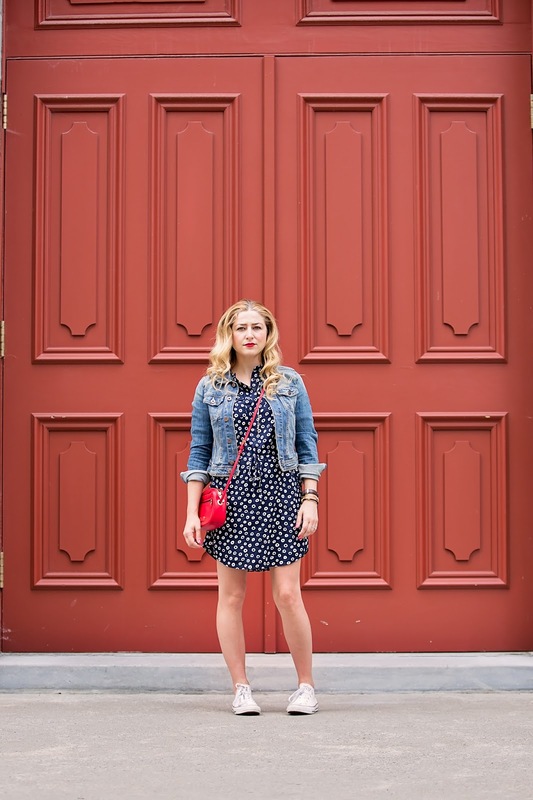 I think a dress + jean jacket + Converse is the PERFECT summer uniform! Might be a little too warm here in Texas but in places with a milder climate it's perfection and you're rocking it! A great dress - loving this chic casual look! love this simple yet chic summer look! Great photos with the red door. Lov ethe shirt dress pattern and the pop of red! Loving this look - this would look great for the 4th of July. Looking cute Crissy!!! I love the print on this shirtdress. The added denim is cherry on the cake. Thanks 4 linking up 2 Top of the World Style.I love a dress with a denim jacket. I also love blue and white dresses. Thus. you have the perfect OOTD, in my eyes! Beautiful photos! (A usual!) And I love hits whole look... dress, sneaks, jacket, and the red crossbody. Come share your amazing work at my Friday Finds Link-Up - hope you come! Thanks for sharing at Friday Finds! Thanks so much for sharing a link for #funkyfriday #linkup @theSUGARRIBBON blog! Gorgeous, Crissy! I love your navy dress with pops of red! Totally adorable! Thanks for sharing with Fun Fashion Friday and have a great weekend! Keep up the good work with the posts! Love that dress! So cute and your pictures are great. Your shirt dress looks so amazing! Great outfit!